With its large ceramic glass window and clean-face design, this luxury direct-vent replace creates the illusion of a site-built replace, but offers the convenience and operating ef ciency of a modern gas system. The traditional luxury clean-face replace is available in 36-inch and 42-inch models. 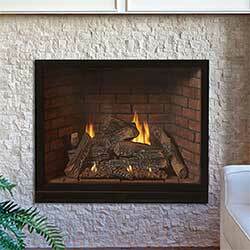 Tahoe luxury replaces are heater rated, so they will mesmerize your friends and family as well as warm your room. Zone heating with a gas replace saves energy while warming the rooms you use most. The available blower helps circulate warm air more quickly. Designed for in-wall installation, our luxury clean-face models require just over 22 inches of depth. The venting connects to the top of the replace, but can run out the wall or up through the roof. Tile or other noncombustible material may be used to conceal the outer edge of the replace to create a true built-in system. A replace barrier screen is included to help protect you and your family from inadvertently touching the hot glass. These direct-vent replaces draw in fresh outside air to support combustion and exhaust combustion by-products to the outdoors. The 5 x 8 vent-within-a-vent isolates the incoming fresh air from the exhaust, yet still requires just a single hole through the wall or roof.